I knew I had to own it or at least give it a good go. After all, what's not to love about flowers, especially vintage sheet flowers! so I thought this was the perfect opportunity to make something cosy for the classroom. I visofixed the big flowers onto a backing sheet and sewed them down. and "borrowed" it to practice on. Yippee! I love love love what she did to it. Taking a very simple quilt to a quilt with really something going on! It's also really durable now, so should be able to stand being in the classroom. just leave a comment if you are interested. pop in and visit sometime. your friend did a great job ... I would say she doesn't really need the practice anymore. I like the "modernly" cut flowers using the vintage sheets, it sort of brings the times closer together. What a cheery and happy looking quilt, and a quick and easy design idea. It is fun to just create such a joyous quilt. I bet the kids love the gift as well and that doubles the fun. Shenleigh is very talented, lucky you have each other to expand your talents. I love this one Deb! It is such a happy quilt Deb I am sure the kids are going to love it! 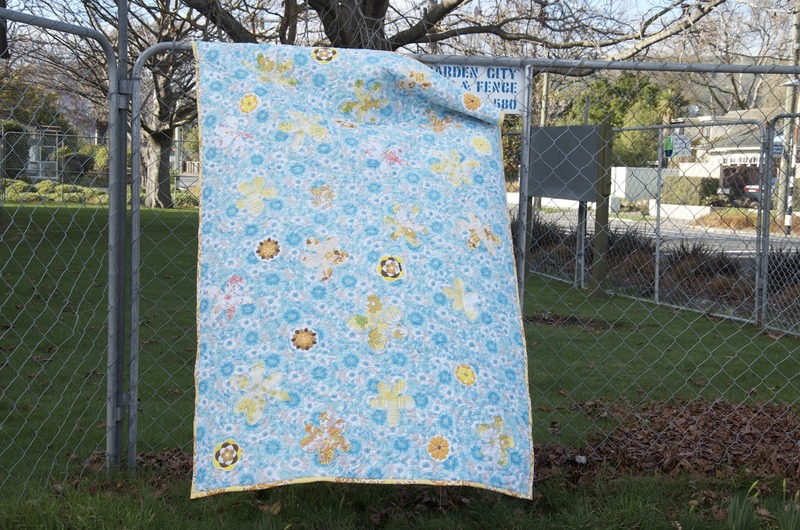 Oh Deb, this quilt is gorgeous! Such fun colours and the quilting is amazing. Gorgeous! that is one lucky sofa!